Gallery IS is hosting a bigger and better First Friday event. 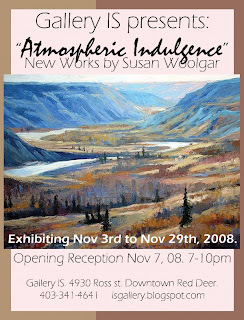 A night of live painting and live music to celebrate the opening of Susan Woolgar's Solo Exhibit "Atmospheric Indulgence". Susan will be creating a brand new, unique painting on the spot, all to the Jazz stylings of local trio DIGINIT. There will be Food, a Wine Bar, Prizes, and a Raffle in support of the Red Deer SPCA. Tickets are $10.00 each. They can be purchased at the Gallery, or over the phone via Credit Card (and picked up at the door). There are a limited number of tickets available. We hope to see many of you come out and show support for Arts and Culture in Downtown Red Deer. November 3rd to the 29th. Gallery hours on the 7th will be 1:00 pm to 5:00 pm. Closed from 5:00 pm to 6:30 pm. Gallery IS wishes everyone a Happy Thanksgiving and we hope you are able to spend some quality time with family and friends. Saturday, October 11th - Open Noon to 3:00pm. The gallery will be open regular hours on Tuesday the 14th. The Gallery will be closed from Jan 1st - 4th. Jan 5th to Jan 31st. Opening Reception, Friday Jan 9th. Erika Schulz - "Stone Icon's", Solo Show. Feb 2nd to Feb 28th. Opening Reception, First Friday, Feb 6th. March 2nd to March 28th. Opening Reception, First Friday, March 6th. March 30th to April 25th. Opening Reception, First Friday, April 3rd. April 27th to May 23rd. Opening Reception, First Friday, May 1st. There will be no special exhibits during the summer months. Aug 31st to Sept 26th. Opening Reception, First Friday, Sept 4th. Sept 28th to Oct 24th. Opening Reception, First Friday, Oct 2nd. Nov 2nd to Nov 28th. Opening Reception, First Friday, Nov 6th. Nov 30th to Dec 31st. The Gallery will be closed Dec 25th, 26th, and 27th. Reduced hours on Dec 24th.